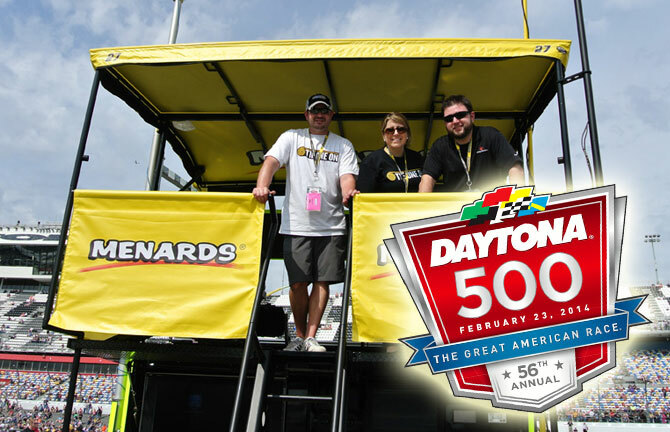 The SmartStraps® brand, redesigned in 2012 by Array Creative, was debuted prominently on the rear panel of Paul Menard’s #27 Menards Chevrolet SS during NASCAR’s Sprint Cup Series opener: the Daytona 500 at the Daytona International Speedway on Sunday, February 23, 2014. Another popular Winston Products brand, TowSmart™, will debut on the Menards’ car at the Brickyard 400 in Indianapolis on July 27, 2014. In addition to having logo placement on Sprint Cup Series car, Array also developed a Race Day Activation for the Winston team, which included infield SmartStraps Racing hospitality program that entertained customers and employees throughout ‘Speedweek’ leading up to the Daytona 500. NASCAR legend Jeff Burton stopped by the SmartStraps Racing infield area for a Q&A session and to snap photos with Winston team members. Other racing personalities visited the lot as well, including current NASCAR driver Clint Bowyer and co-owner of JTG Daugherty Racing and former NBA Star Brad Daugherty.